A dish that is super-healthy and easy to cook makes this a great weeknight dinner and lunch (if you make too much the night before). It’s a tiny bit dry on it’s own even with the juicy orange in the couscous so we recommend you serve some Tzatziki on the side – even though that’s Greek. The Moroccans will forgive us. Mix the mince, spices, onion and orange zest together in a big bowl with your hands. Roll the mixture into about 20 walnut-sized meatballs. Put the couscous in a bowl, pour in the hot stock, cover with cling film and leave to stand for 10 minutes. Heat the olive oil in a frying pan. Add the meatballs and fry for about 12 minutes until nice and brown all over and cooked through. Fluff the couscous up with a fork, stir in the chopped orange, coriander and some seasoning. 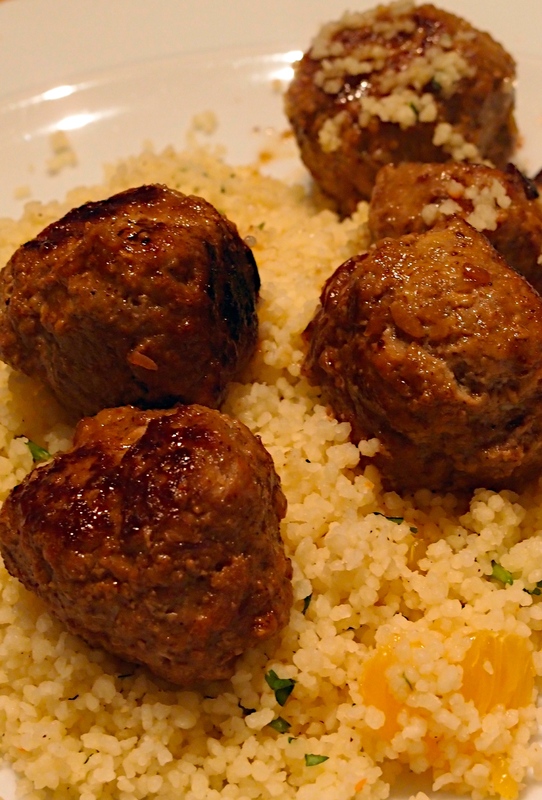 Serve with the meatballs and some tzatziki. The last Turkey recipe … for a while! The turkey in the freezer is finally finished. We actually feel a bit sad… no more free food! So once again, if you have any leftover turkey from Christmas, here’s something else to do with it. Inspired by Vietnamese Pho broth, which is usually made with beef. The recipe comes from BBC Good Food. Heat the stock in a large pan and add the ginger and spices, then simmer for 10 minutes. Soak or cook your noodles according to what it says on the pack, then drain and rinse. Add the fish sauce and lime juice to the stock and taste for seasoning – add more fish sauce if you think it needs it. 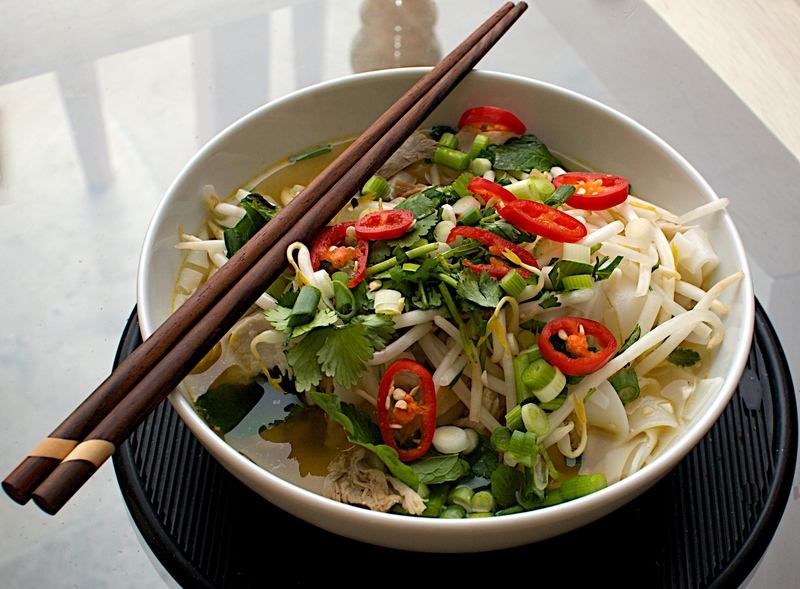 Divide the noodles between 4 bowls, then top with the shredded turkey, beansprouts, herbs, scallions and chillies. Ladle the hot stock over the bowls and serve with the lime wedges. Wine suggestion: Go for a simple, fruity Sauvignon Blanc. We had a leftover glass from Trentino in Italy, which is better known for its Pinot Grigio, and it went perfectly. Hands up who still has Turkey in their freezer! We still have some even after this – so expect another turkey post next week. We were finding it hard to get excited about cooking more turkey until we caught a whiff of this cooking. It tasted so good that Jono had to restrain himself from having two dinners (he just had one and a half in the end). It’s another healthy one too. Heat oil in a medium pan and cook the onion until softened. Stir in garlic and ginger and cook for 30 seconds before adding curry paste; stir for another 30 seconds. Add turkey, stock, tomatoes, cinnamon and a big pinch of salt. Bring to a simmer and cook gently for about 10 minutes. 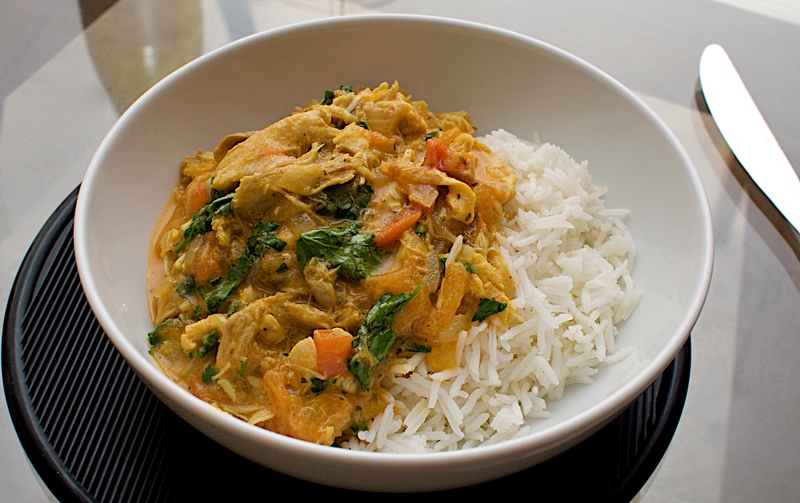 Serve with steamed basmati if you want it to look like our pic. Wine suggestion: we actually had an off-dry Pinot Gris from New Zealand and it went perfectly (Te Mara from Central Otago) or you could have any off-dry aromatic white like Riesling.